I got a call from a friend who wanted to combine multiple Excel files into one Excel workbook. He had a lot of files in a folder and he wanted to get all the worksheets from all the workbooks into one single workbook. While this can be done manually, it would be time-consuming and error-prone. However, a simple VBA code can do this in a few seconds. FolderPath = Environ("userprofile") & "\Desktop\Test\"
Put all the Excel files that you want to combine into a folder. For the purpose of this tutorial, I have created a folder named Test and have six files in it (4 Excel workbooks and 1 Power Point and Word each). Press ALT + F11 (or go to Developer –> Code –> Visual Basic). This will open the Visual Basic Editor. 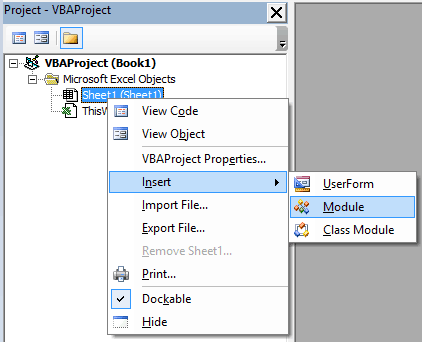 In the VB Editor, in the Project Editor, right-click on any of the objects for the workbook and go to Insert –> Module. This will insert a module for the workbook. Double click on the module. It will open the code window on the right. Copy and paste the above code into the code window. In this line, change the part in double quotes (highlighted in orange) with the location of the folder in which you have the files that you want to combine. In the code used above, the folder is on the Desktop. In case you have it in some other location, specify that path here. Place the cursor anywhere in the code and click on the green play button in the Toolbar options (or press the F5 key). This will run the code and all the worksheets from all the Excel files in the folder would get consolidated into a single workbook. The following line assigns the first excel file name to the variable ‘Filename’. Within the ‘Do While’ loop, ‘For Each’ loop is used to copy all the worksheets to the workbook in which we are running the code. Dir returns the first file name that matches pathname. To get any additional file names that match pathname, call Dir again with no arguments. When no more file names match, Dir returns a zero-length string (“”). Have you ever tried something of this sort using VBA? Do share what you did and we all can learn from it. Save Crazy Amount of Time Using VBA. Check out the Excel VBA COURSE. How to Run a Macro. 20 Useful Excel Macro Examples. Thanks for this tip Sumit…………. Not working for me. I followed all the steps mentioned above. Hi I need some help in developing an extinction tool. Where 80 Percent can be done through formulas. Bit I need some help on remaining things. Will appreciate your help. I am making an estimation tool. The first method worked, but that’s not dynamic. I want the list to refresh if a new file is added to the folder. What about copying different sheets from different excel files to one sheet by adding the new data to the old one ? Thank you so much for this VBA code! Excellent time-saver! 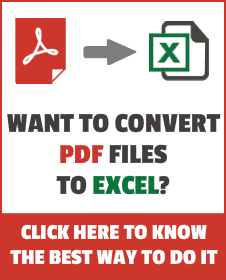 Hi, I have to copy 4 sheets from different excel files in one excel. Now from every file, I have to copy only 1 sheet. names of sheets are mentioned below. Please help I have to submit a report to my manager. I have over 2000 files to combine. I did a test run of 100 and the result was garbage. I am getting an error as bad file name,can someone help me with this error,would be really thankful! It doesn’t work for me, I have “bad file name or number”. do you know how to fix it? very useful ,I like it very much ! When i press f5, nothing happens -! can anyone pls help ? Attempting with CSV files. =) will let you know. I have a query . Suppose I have to merge 652 workbooks into one. The filenames are 1.xlsx to 652.xlsx and i want to merge them in ascending order of their filenames only . Will this code merge it according to their sorted name in the folder or not ?? Hi Sumit, need your assistance with the above macro. 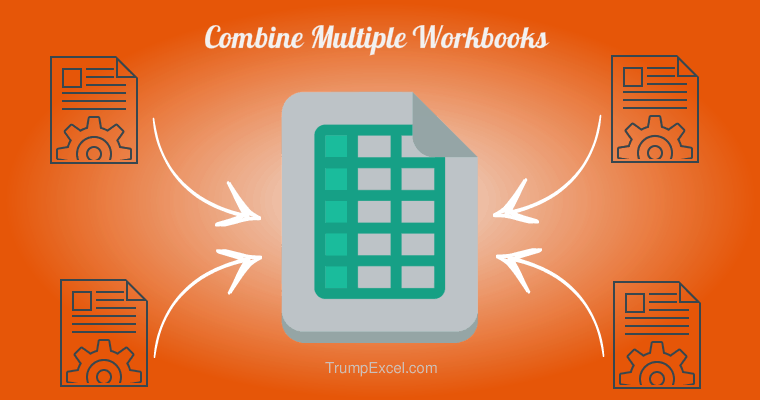 This works good if you want to combine multiple sheets in 1 workbook. 4. Copy and paste it in the created workbook and save. Please help. I can communicate on your official email id too and will be happy if you can provide a solution at the earliest even if it is chargeable. That’s great thanks. It would be even better if it named the sheets after the original file names. Still usable. You need to place a “/” after your path if you copy it in. The code is really work for me using in Excel 2016 after few experiments. 1) The code is worked for both xls and xlsx, don’t need to modify it. 3) Try 1 or 2 workbooks first to see whether it is work for you or not. That last one I can fix by deleting the stupid file directory info, formula by formula. As for the whole yes or no to renaming stuff that already exists… I’m at a loss. TL;DR I don’t know VBA & this formula didn’t work in my scenario. Thanks for posting this! I’m getting “Run-time error ’52’: Bad file name or number” – anyone know how I can overcome this? Need multiple files into one single sheet. Hi, I was able to get the script above to work. How can I modify this script to combined Sheets with the name “Sheet1” from multiple file into one file. so how did you ended up making it work??? What am I missing? I keep getting a run time error 52 (bad file name or number) on this line: Filename = Dir(FolderPath & “*.xlsm*”). I changed it to .xlsm for Excel 2013 for macro. also, can I only combine page 1 of the workbooks to be combined into a single workbook? If my files are on a network drive, do I remove the “Environ” part of the FolderPath? It’s not working for me..!! When i am pressing F5…no combination of sheets..>!! I have a question related to the handling the files with macros (*.xlsm) since the code will pick these files as well during the run. It seems that the macros will not be copied along with the worksheets and therefore some of the formulas may not work in the new workbook. is there any way if the multiple files can be consolidated into one single tab instead of multiple tabs? I am getting the same error….. I have send an email to you for further clarification on it. Pls. have a look.